Maybe one of the worst kept secrets in beer is that Portland is the top craft beer market in the country. This has been the case for many years and, but the numbers continue paint a pretty crazy picture, based on IRI (Information Resources, Inc.) stats I've been looking at in a couple of industry publications. During 2015, the craft segment grew 11 percent and ended with a 44 share (dollar volume) in Portland grocery stores. The next closest segment was Domestic Premium, which lost more than 1 percent to finish at just under 20 share. Keep in mind that IRI expanded the definition of craft to include Blue Moon, Shock Top and Leinunkugel for 2015. 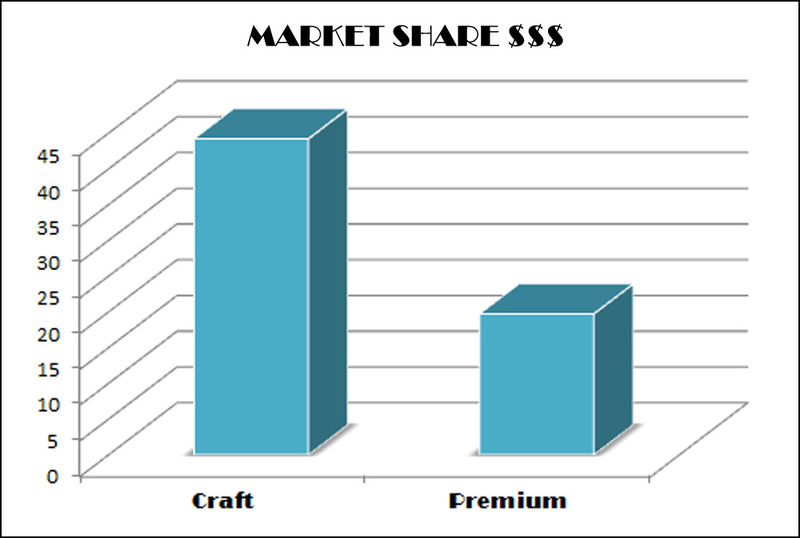 Those brands were flat and combined for less than 3 percent of craft dollar share for the year, which means fake craft brands aren't contributing much to overall craft growth here, as expected. You might think growth in the craft segment is being driven by the large breweries, places like Deschutes, Widmer, Portland Brewing, Bridgeport, New Belgium, etc. But that's not the case. In fact, the big guys collectively lost more than 1.5 percent dollar share for the year, led by Gambrinus/Bridgeport at -14 percent. This isn't your grandpa's craft beer market. It turns out a few up-and-coming breweries showed the biggest percentage growth for 2015. Hop Valley led the pack, up 86 percent and accounting for nearly 2 percent of the market in dollars. I have no idea which specific brands drove that growth, but I suspect it has a lot to do with releasing more options in price-friendly six-packs of bottles and cans. Hop Valley's dollar growth ($1.7 million) led the entire market. Of course, there's more. A host of mostly smaller breweries combined to overcome what the larger breweries lost, a trend started several years ago. Be careful about reading too much into the graph below. Why? 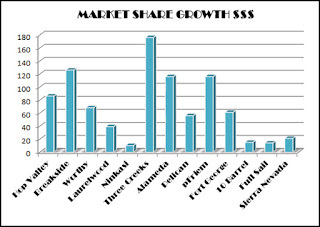 Because Ninkasi's 10 percent growth and Sierra Nevada's 21 percent growth represent a lot more volume (in beer and dollars) than the big growth numbers posted by Breakside, Three Creeks, etc. The graph is best seen as a rough visual aid. We've known for a while that Portland is an increasingly brutal market for macro lagers. It's actually worse than it looks because IRI is based on retail sales and does not include beer sold in taverns, pubs, restaurants or independent convenience stores. 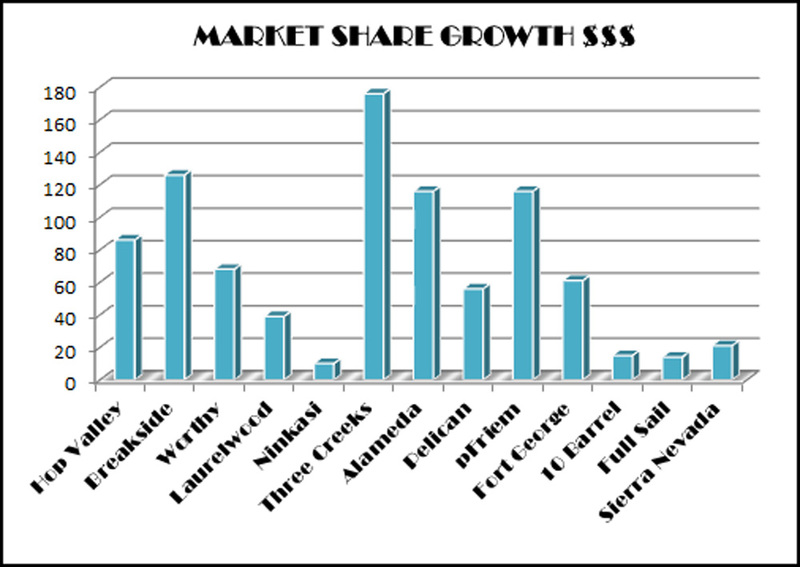 If all beer sold in Portland were part of IRI, craft's market share would easily exceed 60 percent in dollars. Well, that's what I've been told by people who know about such things. There's not much more to say, except let the beatdown continue.